When I first asked my youngest, who turned 8 years old a few weeks ago, what kind of cookies he wanted to take for his class treat, he said, “Do I have to take cookies?”. With out pushing, I swear, he changed his mind and chose a design that was easy to do and super cute! 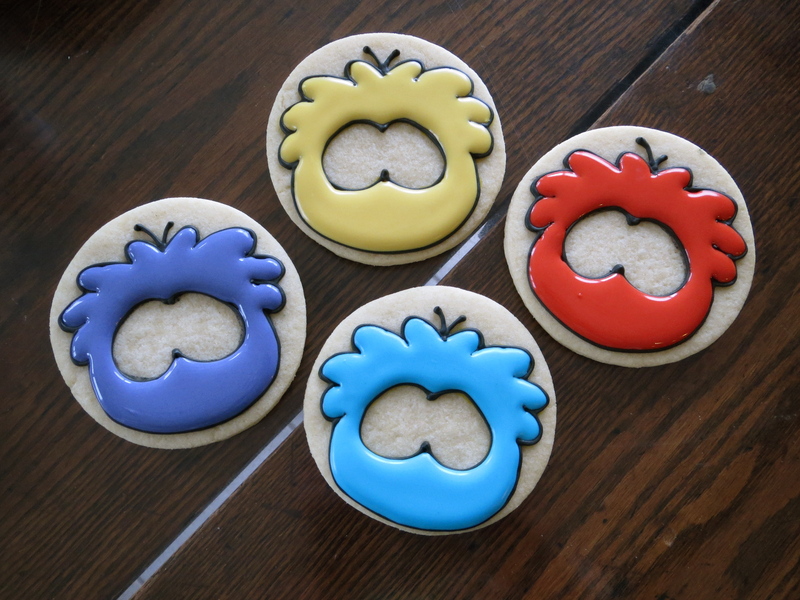 First I found a Puffle image online and did a few sizing adjustments before printing it, to get it to fit on the circle cookies I baked. I traced that image onto card stock to make a template, cutting out the eyes. I suppose that I could have just printed it onto card stock right away….duh. Blog and learn! 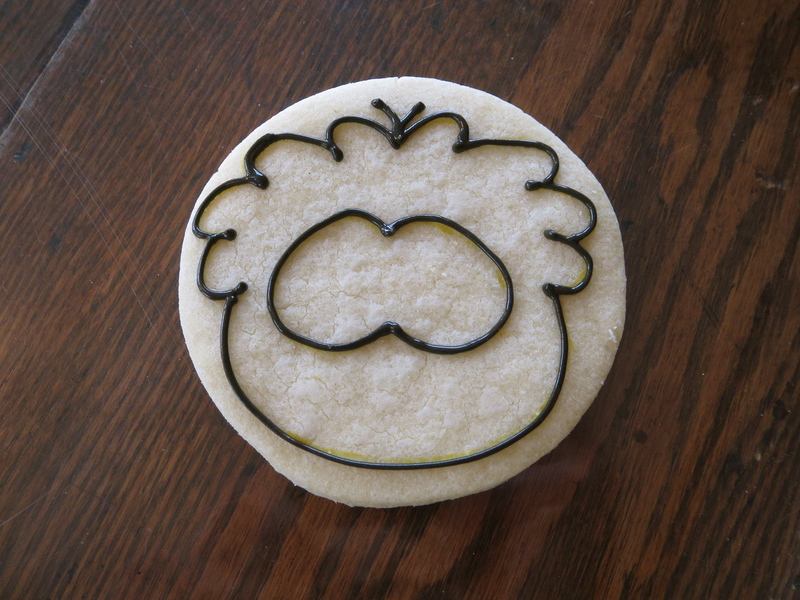 Taking the template and using a food writer, I traced the image on the cookie. My yellow marker decided to stop working so had to switch to black, which didn’t seem to make a difference in the end. Now they were ready for the outline! Following the marker lines, I piped black royal icing, using a #2 tip. 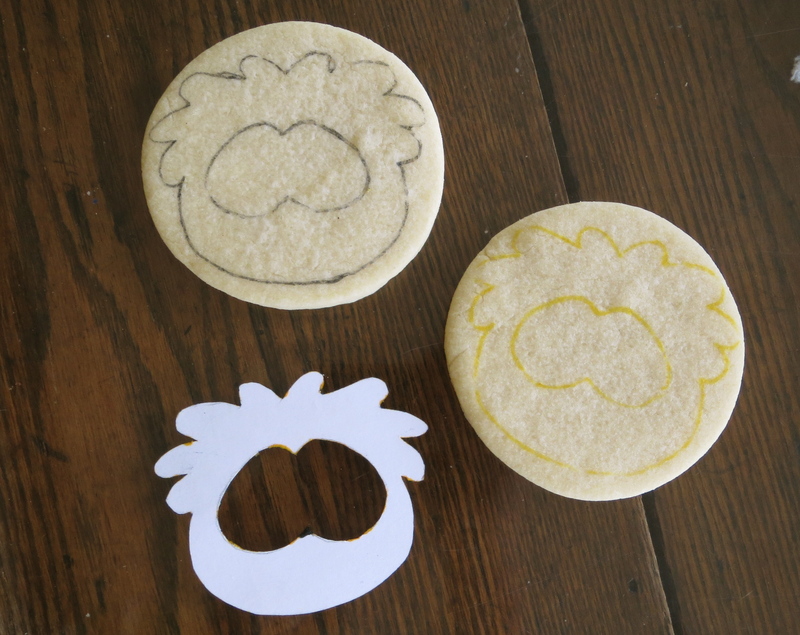 Don’t forget to add the little Alfalfa sprout of fur at the top! About the time it took me to mix up the four colors to flood them with, the black pipping was dry and ready. These were the colors of choice by the birthday boy. Of course I am all about the “Melissa Joy blue”, as we call it around here. Once they are flooded, they are ready for the white of the eyes. My sister was visiting us from Maine the day I started these, so I think I let them dry over night like this. All cookie production needed to stop for hugs and laughter and wine. The next day I finished them off with eye details and their little smile. So sweet and so easy! 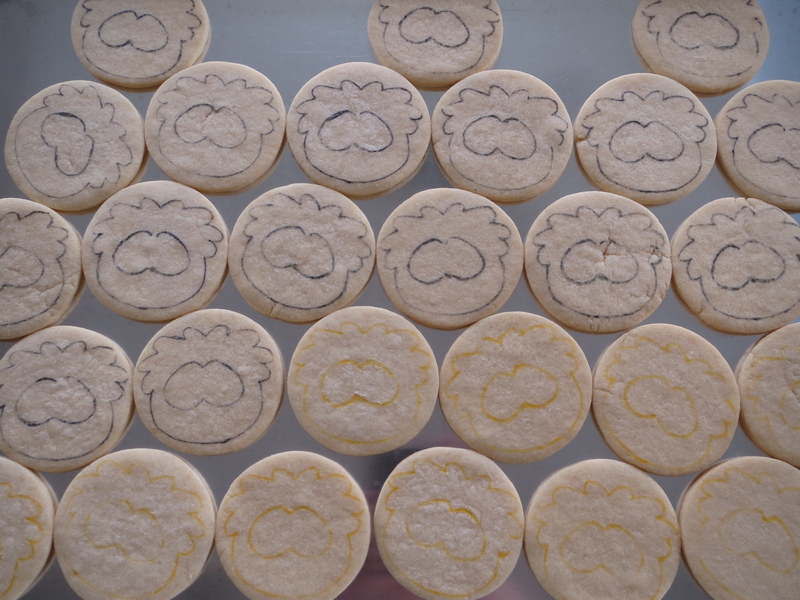 Twenty seven Puffles for the class, DONE! 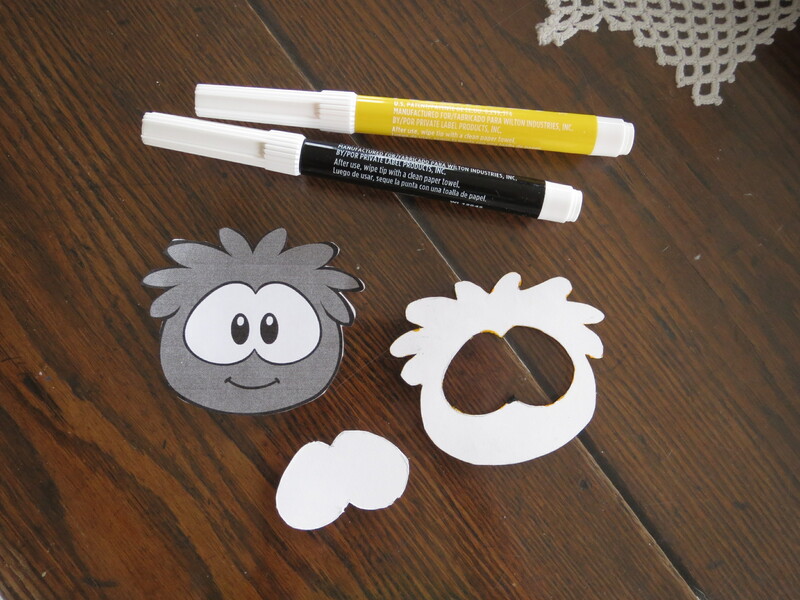 It was requested that I make one special Rainbow Puffle, which the boy of honor ended up saving here at home. Saving, as in not wanting to eat it because he liked it so much. And this was the kid that didn’t want me to make cookies for him in the first place. 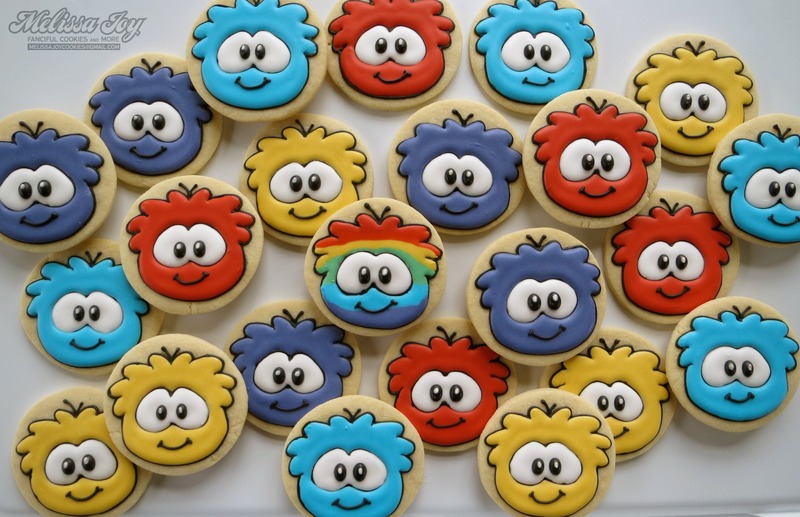 This entry was posted in Birthday Cookies, Cookie Tutorials, Cookies for Kids, For Fun Cookies and tagged birthday cookies, classroom treats, Club Penguin, Puffle Cookies, Puffles, video game cookies, video games. Bookmark the permalink. Beautiful work Melissa 🙂 thoroughly enjoyed going thru the tutorial as soo many kids these days are hooked onto Club Penguin!! One question, did you put a white oval dot onto the black eye-dot?? If yes, white dot was put post the black dot dried up?? Thanks!! Hi Ritika! From what I remember, I piped the black dot then the white dot right after, so it was wet frosting on wet frosting. For eyes that I don’t want to get little craters in (which happens when they dry), I put them in front of a small heater for about 10-15 minutes right after frosting. For some reason, they don’t get the craters then. Hope that helps! Let me know if you need some more information…I will do the best I can to answer them! Do kids in India play Club Penguin too?! 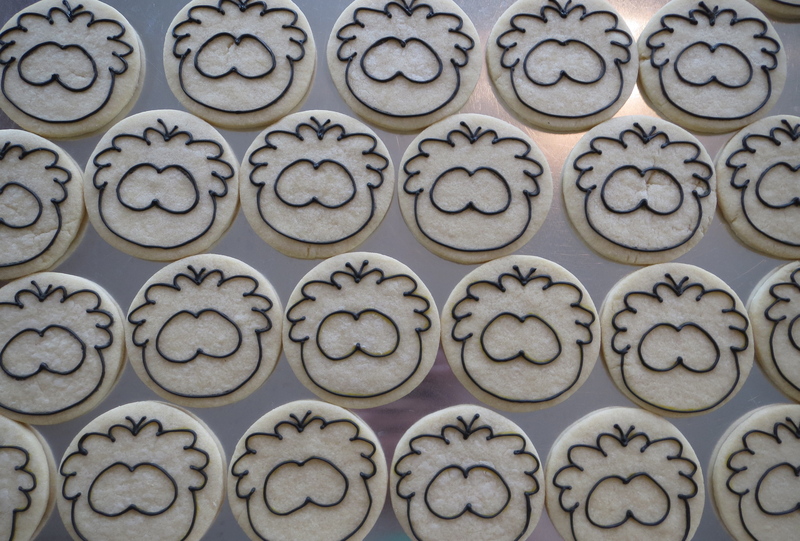 We can leave the games to the kids, and stick to cookies. 🙂 Let me know if you try these! I’d love to hear how they turn out! Yeaaa sounds good 🙂 I am soon planning to try them out and would def get back with the results 🙂 Also, if you cud gimme the royal icing recipe you’ve used. One question, I stay in a very humid area, so cud you help me out with what’s the best way to make the royal icing dry out completely and leave a shine to cookies?? Would be really helpful.. Thanks!! Humidity and frosting do not like each other! I usually just turn my air conditioning on which does the trick, but you might want to try a dehydrator, if that’s possible. LilaLoa has a GREAT post on her technique here: http://www.lilaloa.com/2012/06/dehydrating-cookies-what-you-need-to.html Hope that helps! They are beautiful. Thanks for sharing. 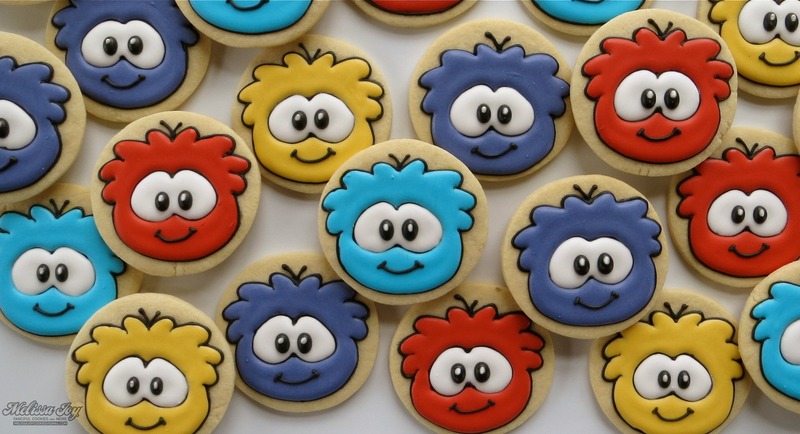 My son loves cookies and puffles. I never heard of a Puffle before, but after reading this post I had to look up Club Penguin. These little guys are adorable! Great tutorial!! Adorable!! Thanks for the how-to! I always wonder about the methodology behind it! Hope you had fun with your sister! Thanks Miss! Is Sister Time ever NOT fun?! Well, they sure turned out perfectly beautiful! Such a cute idea !! Love them !! I love the rainbow one! And I’m a paper template girl myself- nice to see that some pros do it that way! We LOVE these! They are perfect Puffles!! My 4 children have been into Club Penguin since before it was owned by Disney! Is there anyway to send you a picture of the Club Penguin themed Birthday cake I made for my son? They actually posted it on Club Penguin for his Birthday a couple of years ago! Just thought your family might like to see it! That’s so cool! 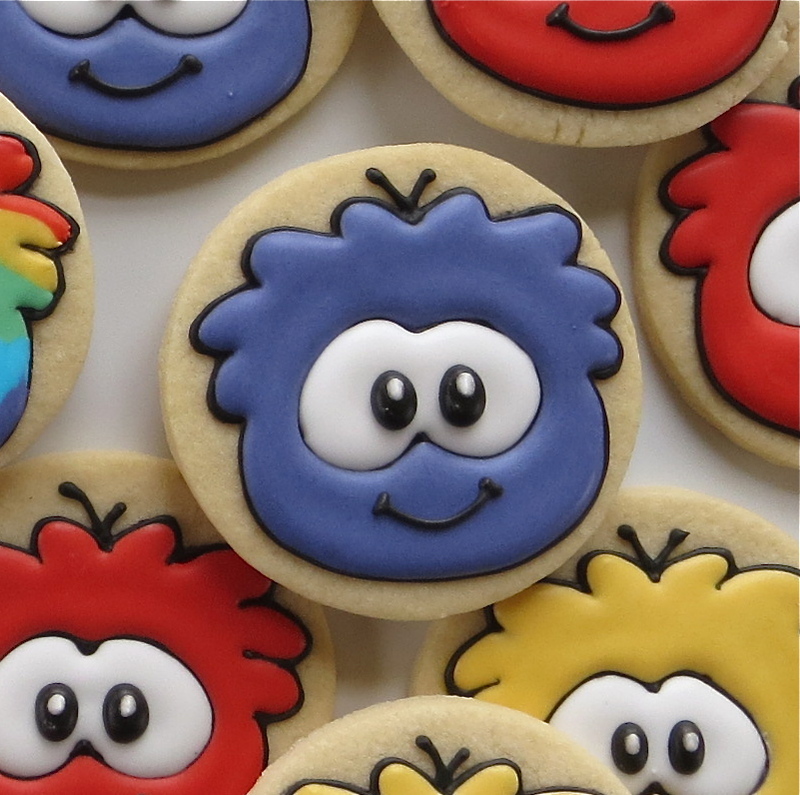 You can post it on my facebook page, https://www.facebook.com/pages/Melissa-Joy-Fanciful-Cookies-More/178684922162687, or email it to me at melissajoycookies@gmail.com. We’d love to see it! Oh, these are too cute and I love your blog! Beautiful work Melissa. LOVE It. 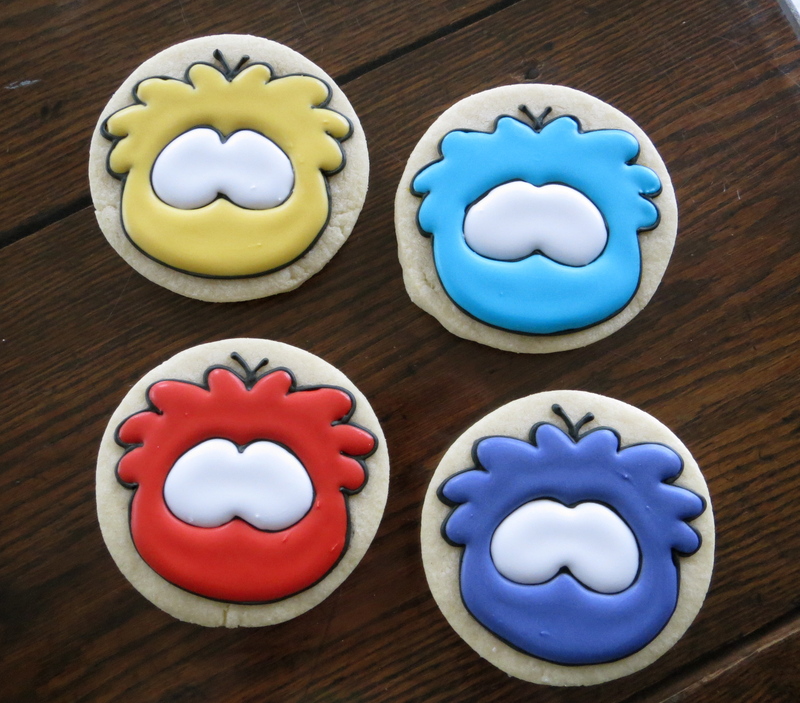 why don’t u make a puffle cookie at Club Penguin. Also can u make a Gold Puffle, if can.I’ll tell all my friends about this. Thx. Amazing! Great job, I love them. Your black lines are perfect – please share the consistency and any tips! For the black icing, I use a pretty thick consistency. It holds it’s shape better and won’t bleed into the other colors that way! delicious. I love it melissa!